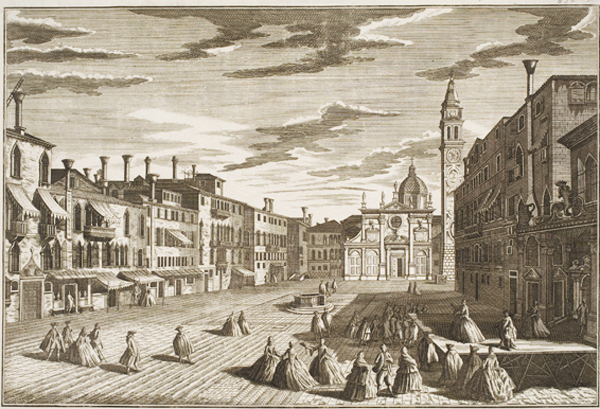 This is an 18th century engraving of Santa Maria Formosa Square in Venice. To the right is a small palace of which we see only a part. In front of it, there is a wooden platform, placed there probably for an open air theatrical performance. The people, who seem to have taken part in a rehearsal, are slowly dispersing into the empty square. In its center is a well. On either side of it are residential buildings, some more distinctive with a certain air of nobility and others more common. Some of these buildings have shops on ground level. We could say that this square is a small, peaceful and harmonic world and, to a certain degree, self-contained. In it the various social classes – noblemen, merchants, manual laborers – coexist side by side, united around the church at the end of the plaza, which, with its tall campanile [bell tower], honorably and maternally dominates the whole picture and enriches the ambience with a lofty spiritual note. This small world assembled around a square is ceremonious and distinguished, yet it is also marked by a note of intimacy. It reveals the spirit of a society where men, far from being dissolved in the anonymous multitudes, tend to create organic and distinct groups that escape the isolation, anonymity and desolation of the individual facing the masses. In this square, so picturesque and human, so distinguished and so typically sacral with the radiating presence of the small church, the different classes live together harmoniously. How it differs from some of the immense modern squares, where on the mare magnum [enormity] of asphalt and lost in an agitated mob walking madly in every direction, men can only see the cyclopean skyscrapers that dishearten them.